DÉPÔT DES CARTES ET PLANS DE LA MARINE - Chine - Détroit de Petchily. Lu Chun Ko ou Port Arthur. Title : Chine - Détroit de Petchily. Lu Chun Ko ou Port Arthur..
Map maker : DÉPÔT DES CARTES ET PLANS DE LA MARINE. Date : Paris, 1885 updated for 1894. Size : 24.0 x 18.1 inches. / 61.0 x 46.0 cm. 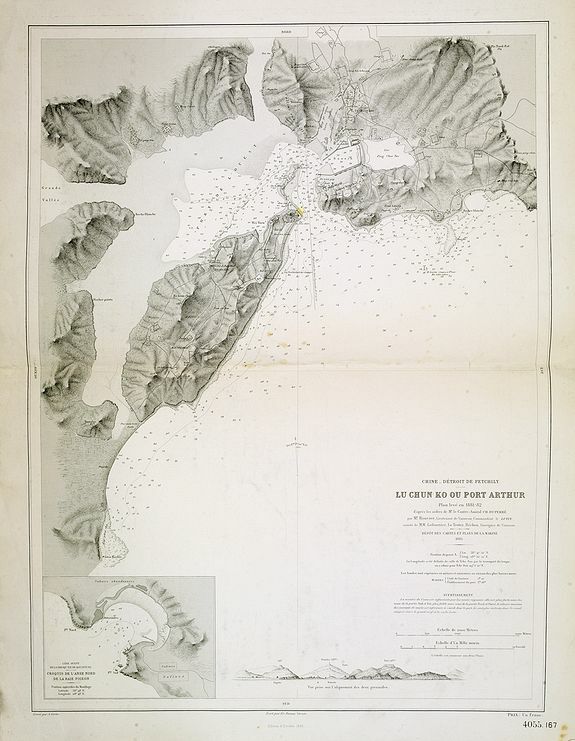 Description :Detailed chart of Lushan or Port Arthur. In 1856, during the Second Opium (or Arrow) War, an English captain, Lieutenant William C. Arthur, towed a damaged English gunboat into the harbor at a fishing village, and the English dubbed the harbor as Port Arthur. The Chinese had given little importance to the area, but by the 1880 they realized its strategic significance. The Chinese took control of the area and a string of forts were built across the hills overlooking the water. The settlement of the war between the Chinese and Japanese in 1894, gave the area to the Japanese. Under international pressure, seven months later the Japanese gave it back to the Chinese. Russia helped China pay off war reparations that it had acquired with defeat at the hands of the Japanese, and in exchange Russia in 1898 was allowed to rent the combined area of Port Arthur and Dalian, 30 kilometers northwest of Port Arthur. The Russians changed Dalian to Dalny. Port Arthur and Dalny offered the Russians year-around ice-free port facilities. Russian commerce traveled by rail through Siberia and Manchuria to Darian, and the Russians industrialized Darian. They started businesses in smelting, timber, shipping and they built breweries. The Japanese took control of the area after they defeated the Russians in the war of 1904-05. After Japan's defeat in World War II the Russians returned, with Dalian under joint China and Soviet control until 1955, when it reverted to full Chinese sovereignty. It remains is a commercial and trade center, with a protected harbor, manufacturing and fisheries. Condition : Some spotting along center fold. Light house coloured in red and yellow.